In Ethiopia, Obama Calls For An End To Oppressive Tactics : The Two-Way During a joint news conference with Ethiopian Prime Minister Hailemariam Desalegn, Obama said that a country is more successful when "all voices are being heard." 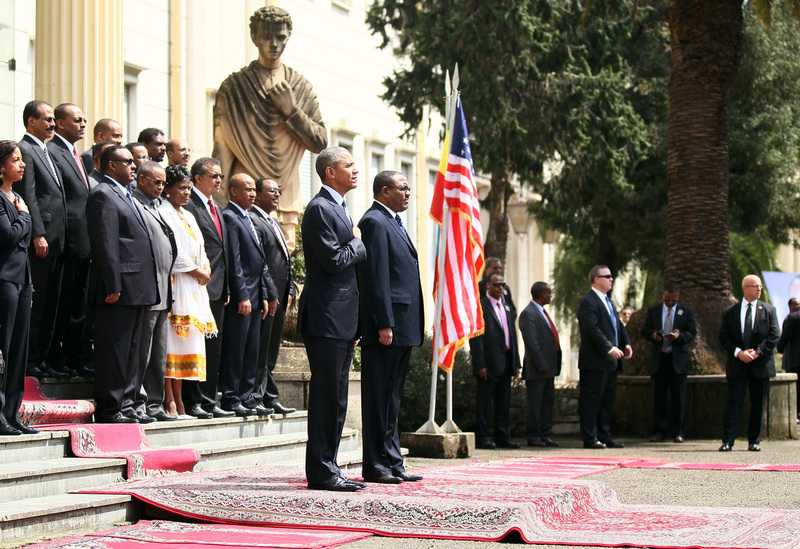 President Obama and his delegation stand Monday during a welcome ceremony with Ethiopia's Prime Minister Hailemariam Desalegn at the National Palace in Addis Ababa, Ethiopia. Kicking off a two-day trip to Ethiopia, President Obama called on the country to end its crackdown on journalists and to be more open politically. Obama spoke Monday at a joint news conference with Ethiopian Prime Minister Hailemariam Desalegn. "When all voices are being heard, when people know they are being included in the political process, that makes a country more successful," Obama, who became the first sitting U.S. president to visit the country, said according to The Associated Press. The Ethiopian prime minister defended his country, saying its commitment to democracy is "real, not skin deep." The New York Times reports that another big subject of discussion for Obama in Ethiopia will be the situation in South Sudan. When it split from Sudan in 2011, the Obama administration saw it as a sign of a bright future for that part of Africa. But the split has instead been marked by ruthless tribal clashes. "Mr. Obama, accompanied by Ms. [Susan] Rice, now his national security adviser, will convene a meeting on Monday to try to forge a peace in South Sudan, in his most direct personal intervention since the violence broke out more than 18 months ago. During a visit here to the Ethiopian capital, he will meet with regional leaders to try to build a consensus behind a peace proposal, and to come up with a backup plan in case that fails involving increased sanctions and possibly an arms embargo. "The situation is so grim that White House officials hold out little hope of success. Presidents rarely get involved in a diplomatic meeting without a reasonably guaranteed outcome and Mr. Obama's aides do not usually talk about a Plan B before a Plan A has failed. But Mr. Obama and his advisers say he had no choice but to try since he was coming to the region anyway to visit Kenya, his father's home country, and to Ethiopia, where the executive branch of the African Union has its headquarters.
" 'This is a classic case of venal leaders squandering a huge opportunity that they themselves earned, that we all in the international community supported them to obtain,' a senior administration official told reporters on the plane during a briefing with ground rules that required anonymity. 'So we can't undo this for them. They've got to fix this.' "